In general, solids might be classified in crystalline or amorphous. On the one hand, the crystalline solids comprise a regular set of molecules, atoms or ions into a rigid lattice which is characteristic of each substance. Thus, most crystals are anisotropic (the cubic system is an exception), namely, depending of the direction in which their properties are measured they can change. On the other hand, the amorphous solids were considered to be disordered crystalline solids (Stachurski, 2011) but many amorphous solids do not have a crystalline form, therefore, amorphous solids could be defined as substances with a random arrangement of atoms or molecules. Thus, amorphous solids are isotropic because their properties do not vary with the direction they are measured. Some examples of amorphous materials are glass, metals, polymers or thin films. Amorphous solids are less stable than crystalline ones and they can be converted into a desirable shape by molding them (Colfen and Meldrum, 2008). This provides them importance in the crystallization field since they can work as amorphous precursors to form crystalline phases. Crystalline material can be divided in single crystals and polycrystalline materials. On the one hand, a perfect single crystal could be defined as a crystalline solid with a continuous and unbroken lattice and with no grain boundaries. However, single crystals without defects or dislocations are very difficult to find in the nature or to synthetize in a laboratory. Thus, single crystals with curved surfaces are characteristic of many biominerals. Moreover, a definition just based in the crystal lattice imperfections is not possible because for example a polycrystal or a mesocrystal show the same diffraction of a single crystal, making it difficult distinguish them. Therefore, a practical definition for a single crystal was given by Colfen and Meldrum (2008) such “a single crystal is a solid body with a large coherence length, which shows a diffraction behaviour characteristic of a perfect three-dimensional alignment of its building units”. On the other hand, a polycrystalline particle is formed when single crystals or grains are agregated together in random orientations. A substance with the ability of crystallizing into different crystal structures shows polymorphism. The different polymorphs of a substance are chemically identical but exhibit different physical properties. Polymorphism is important in different fields such as pharmaceuticals, pigments, foods or agrochemicals because the properties of the solid-state structure depend on the polymorph. Hence, the study of how to predict and control the polymorphism is a field of high interest. Changes in the temperature, solvent or the use of additives can be used to control the formation of different polymorphs. Examples of different solids that present polymorphism are Calcium Carbonate which can crystallize in three polymorphs namely calite, aragonite and vaterite, or Carbon with its two polymorphs graphite and diamond. The crystals can be classified into different general systems according to the table below. Table1. The seven crystal systems. Copied from ref. Different polymorphs can have different crystal system, for example the Silicon dioxide crystallize in three polymorphs namely cristobalite (regular), tridymite (hexagonal) and quartz (trigonal). They also can present different habit which is the shape that a crystal adopts depending on the occupation of each crystal face and the grade of growth of each face. The crystals might grow faster in one direction than in another and it confers them different forms or habits. Unless is not the most common, some polymorphs can have the same crystal habit. Many crystals show some form of aggregation or intergrowth that is indicative of impurity. These composite crystals may appear in symmetrical forms or in random clusters. Some kinds of aggregation are the parallel growth or the twinning. In the parallel growth one form of a substance grow on the top of another form, the faces and edges of these forms are parallel. Twinning is a way of intergrown between two individuals with similar form which are joined symmetrically about an axis or a plane. The solubility of a substance is the maximum quantity of solute that is dissolved in a given amount of solvent. When the concentration of the solution exceeds the solubility, the solution is supersaturated and the precipitation is driven. The supersaturation, S is defined with the following equation where c is the concentration of the species and ksp is the equilibrium molecular solubility product. Once the system is supersaturated, the first particles can grow from solution when a critical nucleus of the new phase is formed. This is the crystallization process in which nucleation is followed by crystal growth. The nucleation is called classical when the systems do not contain crystalline matter. In classical crystallization the crystal is formed under low reactant and additive concentrations and it is driven under thermodynamic control. Classical nucleation can be divided into two groups. Nucleation if the first formation of the solid phase and is caused by the molecules, atoms or ions aggregation in a saturated solution where the nucleus prefer grow than redissolve. On the one hand, the homogeneous nucleation occurs when in a supersaturated solution a stable nucleus is formed spontaneously. It is a difficult process where the molecules are coagulated and become orientated into a fixed lattice. A stable nucleus can be result of following collisions between the molecules in solution. Moreover, all the molecules have the same size before growing which is called the critical size rc. The particles smaller than rc will redissolve and the particles larger than rc will continue to the next stage, the crystal growing. On the other hand, the heterogeneous nucleation is induced by surfaces, dust or foreign nuclei present in the solution. This kind of nucleation is common at lower supersaturation levels and is more frequent than homogeneous nucleation which is not a common event because is practically impossible to have a solution completely free of foreign bodies. The barrier of energy decreases in heterogeneous nucleation because there are surfaces available to nucleation in solution. However in a solution with impurities homogeneous nucleation can also occur despite of the heterogeneous one will dominate. -Diffusion and/or convection mass transport from the liquid phase to the crystal surface. -Surface integration by the incorporation of material into the crystal lattice. This process starts when the particle adsorb a growth unit on its surface. Secondly, the solvation shell of the crystal is lost and the growth unit diffuses into the adsorption layer. Finally, when the growth unit finds a point to be built into the lattice, the solvation shell is completely lost and the growth unit is incorporated to the lattice. The rate of the crystal growth makes variations in the shape of the crystals. Thus, depending on the growth rates, the crystallographic faces of a crystal change. Moreover, crystals with different sizes are obtained depending of the predominance of nucleation or crystal growth. When the nucleation can be induced by the presence of existing crystals is called non-classical nucleation. In this nucleation, the concentrations of reactant and additives are higher. The high amount of precipitating material produces that crystal nucleus can be formed and grown to nanoparticles which can be aggregated and form polycrystalline particles. However, the nanoparticles aggregation process can be controlled by the use of additives to produce single crystals. Thus, solute crystals present or added in a supersaturated solution make that the nucleation occurs more easily and in a more reproducible way. The single crystals formed by non-classical nucleation are always formed from precursor nanoparticles which can interact and orient themselves into crystalline register. Finally these nanoparticles are attract by der Waal forces and can fuse together into a homogeneous single crystal. The shape of this single crystal is difficult to predict because this process occurs usually by a fast and kinetically controlled pathway. 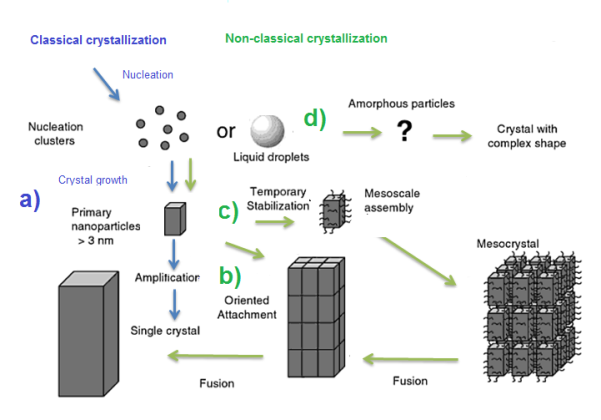 Meldrum and Colfen (2008) described some crystallisation processes that take place by a non-classical nucleation such as the formation of intermediary clusters, the crystallization via amorphous intermediates or the mesocrystallization. The mechanism of non-classical nucleation involves transient particles precursor which are difficult to detect. Thus, the crystallisation is independent of ion products or solubility because the precursor particles are formed independently at different locations. An interesting case of precursor particles are the mesocrystals which are defined as “colloidal crystals that are build up from individual nanocrystals” (Meldrum and Colfen, 2008). Mesolcrystals are difficult to detect because they have practically the same morphologies and diffraction patterns than single crystals. It was shown that single crystals can be formed by non-classical nucleation via mesocrystal precursor in presence of inhibitor additives which assist the crystallisation through intermediates (amorphous, metastable or mesocrystals). A schematic representation of classical and non-classical crystallisation pathways is shown in Figure .. Pathway (a) shows the classical crystallisation (in blue) where nucleation clusters appear after nucleation step and they grow to form primary nanoparticles which are amplified to form single crystals. In green is shown the non-classical crystallisation where different intermediates can be formed. The primary nanoparticles can be oriented and interact forming iso-oriented crystals that fuse to form single crystals (b). Primary nanoparticles can also be stabilized and form mesocrystals that fuse to finally form single crystals (c). Finally, amorphous particles can be formed transforming in complicated morphologies (d). Figure 3. Schematic representation of classical (blue) and non-classical nucleation (green). "States and Properties of Crystalline Material." UKEssays.com. 11 2018. All Answers Ltd. 04 2019 <https://www.ukessays.com/essays/chemistry/properties-crystalline-6971.php?vref=1>. "States and Properties of Crystalline Material." All Answers Ltd. ukessays.com, November 2018. Web. 23 April 2019. <https://www.ukessays.com/essays/chemistry/properties-crystalline-6971.php?vref=1>. UKEssays. November 2018. 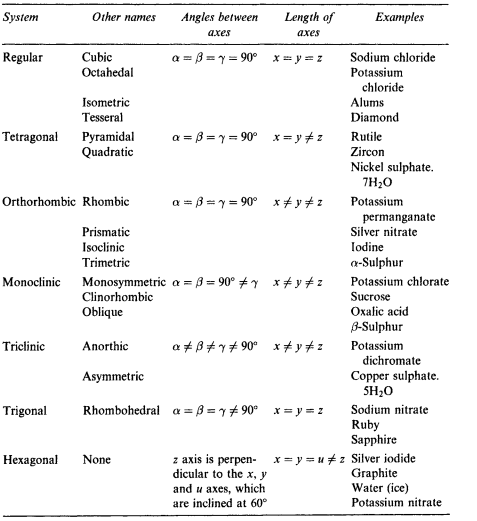 States and Properties of Crystalline Material. [online]. Available from: https://www.ukessays.com/essays/chemistry/properties-crystalline-6971.php?vref=1 [Accessed 23 April 2019]. UKEssays. States and Properties of Crystalline Material [Internet]. November 2018. [Accessed 23 April 2019]; Available from: https://www.ukessays.com/essays/chemistry/properties-crystalline-6971.php?vref=1.